This issue's article is about a new centre where Vedic Maths is taught, which has just opened up. The article is from the Borneo Bulletin, Nov 26th 2009. MATHS and fun are two words that you don't often find in the same sentence but a new supplemental programme in town is going to change that. IKIDS Enrichment tuition school is now providing the Math Monkey Programme which is an academic enrichment programme that uses an ancient wisdom of Vedic Math from India, a unique approach with incorporation of fun and interactive game-based activities that helps children and parents solve mathematical problems with lots of fun in the process and makes it possible to quickly solve complex math problems mentally and is designed to turn a child's brain into a highspeed calculator, a press release stated. Professor Kenneth Williams, who is the chief academic officer of Math Monkey believes that children shouldn't have to rely on a calculator or pencil and paper for something the mind is capable of doing without them. Professor Williams has been studying Vedic Math since 1971 and has dedicated his academic career to researching Vedic Math from ancient texts. Vedic Math gives children a good understanding of the very foundation of mathematics, and allows children to perform calculations mentally with great accuracy, simplicity and speed. It is a powerful checking tool and helps to save lots of students' precious time in examinations. Through mental work, children progress faster in terms of mental agility, capacity to hold ideas in the mind and to remember past impressions, as well as developing flexibility on their methods of tackling problems including evolving their own strategies to meet new challenges. By instilling a love of Maths in young children, Math Monkey will be able to nurture future generations of creativity and innovation. The main goal is to give children a strong fundamental basis in Maths and help them reach their full potential. In fact, children at Math Monkey are taught much more than numbers. They develop problem-solving, reasoning, memory, concentration and critical thinking skills on their way to becoming big thinkers of tomorrow. This helps considerably in other academic areas as well as self-esteem and personal growth. Classes at Math Monkey are categorised into different levels. Children from age four to 12 are assessed based on their current mathematical aptitude before being placed in the level most suitable for them. Children can join the classes for a free trial and assessment before enrolling in the programme. Parents are encouraged to bring their children over for a full Math Monkey experience. An Introductory course of 10 hours is now available at www.vedicmaths.org (click on DVDs). It is a great pleasure to finally be able to offer this course, which is based on nearly 40 years of experience as a teacher and researcher in Vedic Mathematics. An Advanced course will also be ready in a matter days. Faculty of Management Studies, University of Delhi, India INVITE YOUR PARTICIPATION IN THE NATIONAL WORKSHOP ON Integrating Spirituality and Mathematical Science December 21 - 23, 2009. This is aimed primarily at doctoral students. Singapore Vedic Academy is looking for dynamic and enthusiastic Vedic Maths Teachers and Specialist to work in Singapore. I thought I'd share this very interesting graph I discovered in our times-table around 5 years ago (November 2004). I have aptly named it "OneEye" or "1i". If you graph this using MS-Excel (using the surface-wireframe-contour graphing tool), you get one amazing graph. When I discovered this for the first time, my jaw dropped and I stared at it for a good hour or two wondering what the heck it was? This then led me to an exponential learning curve like I've never experienced and, very quickly, it opened the door for me to learn many other things about Science, Art, Epistemology and much more. None moreso than my re-discovery of the irrational number/ratio Phi (1.618). I mean, I've studied Science (Physics, Mathematics) and have seen graphs and fractals of all kinds, but never something like this and in such a simple way. I have dedicated a site specifically for this called EyePhi.com. There's more to it and if you look into the pupil, you may see some other perplexing images of animals, food and religious/spiritual symbols as well. This is up for interpretation and only relative to the observer, of course. But for me, it is more than just a graph! I hope you enjoyed this article and welcome you to visit my site and share your views so that others may see your point of view. 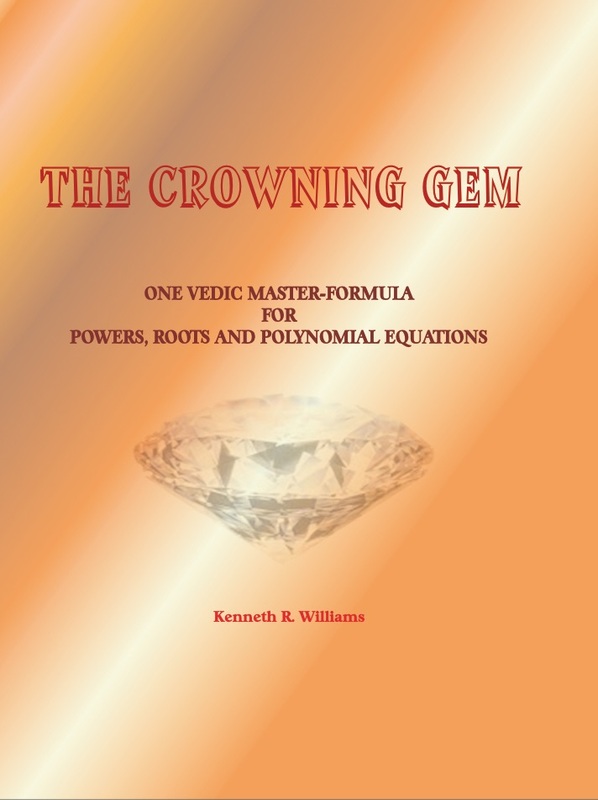 Many thanks to Ken Williams for allowing this article to be included and I will try to learn more about the wonders of Vedic Mathematics. I am Sumit Sharma,Engineer in Binani Industry Ltd.,sending a formula to multiply any digit with 12. An acknowledgement was omitted form the main article in our previous newsletter. That article made use of the Introduction and Preface to the book 'Vedic mathematics for Schools' by James Glover published in 1995, from which quotes were taken.